Two notable MMORPGs launched in 2014 with subscription models: Elder Scrolls Online (ESO) and WildStar. Four months ago, Bethesda Softworks announced that ESO was going B2P (buy-to-play). Today, Carbine announced that WildStar is going F2P (free-to-play). For whatever reason, game developers have been painfully slow on the uptake that gamers do not like subscription MMORPGs. The only sub-based MMORPG that has been able to maintain a meaningful playerbase is World of Warcraft (WoW). WoW is in the unique position of having a huge amount of polished content and a huge community, which are barriers to exit for existing players. That is, players have invested so much into WoW and their characters / guilds / community that they stick around, even though that requires a subscription. As I’ve said previously, even Blizzard would struggle to replicate the success of WoW in a new subscription-based MMO, and Blizzard has pursued non-subscription models for their recent new releases. When I read the World of Tanks (WoT) official forums, sub-Reddit, and WoTLabs forums, one question comes up more than any other: how do I improve my gameplay? This is particularly challenging for players who have hit a ceiling in terms of their measurable performance (e.g. win rate, WN8 rating, etc) and are not sure what to do. While players can download replays of highly-skilled players, those replays don’t capture the thinking process of the player behind the tank – you see their actions but don’t necessarily know the how’s or why’s behind them. Therefore, in this video series I share what I learned as I progressed towards account Unicum rating (top 1%) with silver ammo only. I talk through how I’m reading the battle as it unfolds and discuss key decisions and mistakes. My hope is that these videos meaningfully help players improve their gameplay. This guide covers the wildly popular ELC AMX, the tier 5 French light tank in World of Tanks (WoT). In my opinion, the ELC AMX is the most consistently incorrectly played tank in all of WoT, because players fail to adjust to its unique characteristics. I’ve had very good results playing the ELC AMX as described in this guide, and hopefully it will help you improve your gameplay. 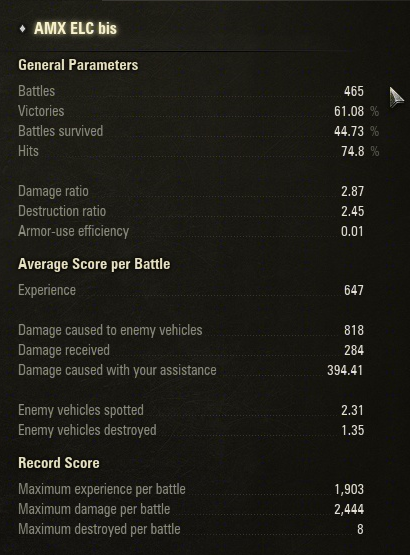 My ELC AMX stats @ 465 battles: 61% WR, 818 dpg, 2.31 spg, 1.35 kpg, for a 3.6k WN8 (Super Unicum). Note I use silver ammo only. About 6 months ago, I bought my first mechanical keyboard, the CM Storm QuickFire Rapid with Cherry MX Red switches. As I wrote in my review, the keyboard worked great for gaming. A short while later, I read an article that strongly recommended Brown switches for gaming. I wondered whether I’d made the wrong decision in choosing Red over Brown, given that I hadn’t tried either prior to purchasing the keyboard. Given that I care about my gaming performance, I decided to conduct hands-on testing of Red and Brown Cherry MX switches to better understand the experience of using them and determine which worked better for me. I also wanted to test the switches with and without Red and Blue O-rings.